Most clients I speak to understand clearly the benefits e-learning can bring to their business. They also understand the benefits of using professional e-learning course designers. For some, however, there are niggling concerns regarding the development process and the quality of the end result. Often these concerns occur when the subject matter or structure of the course is particularly complex. My solution is rapid prototyping. More of that in a moment. First, however, why are there concerns in the first place? Usually it is because clients mistakenly believe they will only have an involvement in the design process at the beginning – during the analysis and discovery stage – and close to the end when you evaluate and give feedback on the final course. It is true that some e-learning course providers work in this way, but there is a better solution – rapid prototyping. If you are familiar with manufacturing processes you will have heard of rapid prototyping before. It has been in use for decades, although modern technology, including 3D printing technology, makes it much more effective. The principles behind rapid prototyping are also ideally suited to creating e-learning courses. 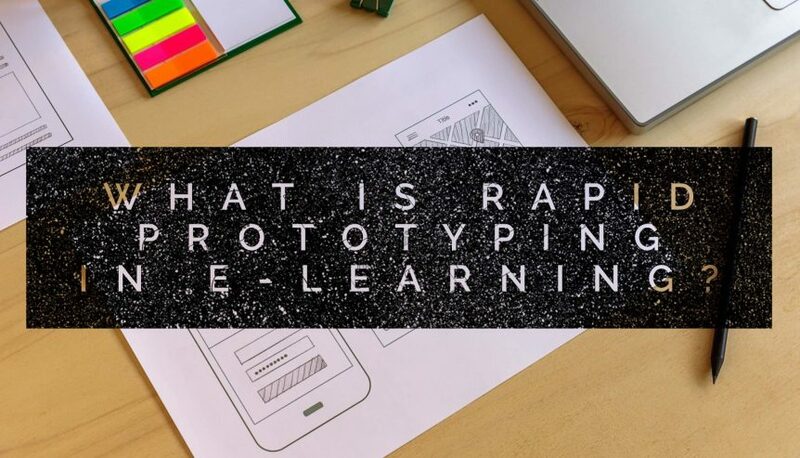 Rapid prototyping involves the creation of a working but scaled down version of your e-learning course. It is different to seeing storyboards as you can use and interact with the prototype. This allows you to get a feel for how the final course will not only look but also what the learning experience will be like. It is possible to create rapid prototypes because they are scaled down. In other words, building or evaluating a prototype is not about getting into the nitty gritty of the content. Instead, it is about taking an overview to consider things like design, learning experience, and potential outcomes. Allows you to review the project early in the development process. Ensures the final course delivers on your expectations. Improves communication between everyone involved in creating the course, including you and your team. Is a flexible approach to creating a course, i.e. it is much easier to change something at the prototype stage than it is to make changes at the final design stage. It saves time as the final course will be what you require so there will be less need for amendments or changes. Improves the creativity included in your course and the overall quality. This is because the designers and technical team working on your course will have more confidence in the design when they know it is moving in the right direction. Rapid prototyping is an effective tool for any type of course but it is particularly beneficial when the course structure or subject matter is complex. The best process to follow when using rapid prototyping is to first get a full brief and scope on what should be in the e-learning course. It is also important to get an understanding of the objectives of the course. It is possible to develop the prototype with this information. The prototype will include things like a mock-up of the design, the structure of the modules and content, the navigation, details of the media the designers will create, and details of the interactive elements. That said, the elements will not be coded, the design won’t be finalised, and the text won’t be written. However, from the prototype, you will understand the direction the designers and developers are taking. You will also understand the style, structure, level of feedback you will get from learners, and more. You will then get a chance to review the prototype. Any feedback you give will be implemented in the prototype for you to review again. Once you are happy, the full course development work can begin. As you might expect, creating a rapid prototype means the initial stages of course development take longer. The overall development time for the e-learning course, however, is usually shorter. Plus, you will have a better e-learning course, and the development process will be smoother.